The “Chilean winter” in 2011 was the largest social mobilization in this country since the end of the dictatorship in 1990. In a time of global mobilization, the Chilean student movement attracted the attention of the world because they were challenging the commodification of education in a mature neoliberal society with little participation of social stakeholders. The Chilean university system, despite its recent widespread growth, is known to be one of the most privatized and expensive in Latin America with high rates of student debt and a tendency to reproduce social inequality. As a result, the students’ claim of transformation of education from a private consumer good to a social right garnered important support in the Chilean society. This changed the political agenda and influenced the presidential election of 2013, namely in the political project of Michelle Bachelet. Her government now aims to enact this promised program inspired by the claims of the 2011 student movement: public, free and quality education, starting the gradual elimination of university tuition. Thus, since March of this year, 50% of the poorer students will access superior education without tax in the state universities and some private universities willing to accept the government’s conditions of public funding. At the end of this government’s term in 2018, the expectation of the Secretary of Education is that free education will be extended to 70% of students in the same institutions. Is this implementation a victory of the 2011 student movement? Taking into account the actual positions of the leadership of the movement, the response should be negative. First, the beginning of free education is only the result of a budget allocation and it is not a law yet. Therefore, the position of the conservative political opposition and the neoliberal sectors within the official ruling government coalition should be to legally obstruct the measure. Second, the possibility of 100% free education is not clearly defined, more so even with the announcement of fiscal adjustments because of the falling price of copper. The Secretary of Finance was declaring that the cutbacks will affect principally the education budget. In fact, for the student movement, the government policy is nothing more than an extended scholarship. If the possibility for access to free education depends on student poverty, education is not a universal right. Moreover, two main tenets of education in the neoliberal view, the voucher and focalized logic, remain. Thus, the student movement has not seen its influence in educational reform. If partial free education is not a victory, is it a loss? This question echoes a classical debate in social movement studies: how to measure the political impact of a social movement? On one hand, some research overlooks the (often absent) electoral effect of cycles of mobilization in the political system. On the other hand, they focus on the long-term change of beliefs, norms and cultural patterns, neglecting the political dimension of collective action. There is a need for integrating both views in order to create a more accurate picture of social movements. 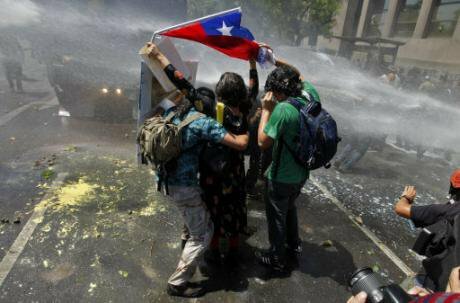 In particular, the case of the Chilean student movement offers an empirical possibility to clearly articulate the necessity of both the cultural and political approaches. The student movement left its mark on the political system. Four of its leaders became deputies in the National Congress. For instance, Camila Vallejo (ex-president of the University of Chile Students’ Federation in 2011) is one of the most well-known congressmembers, Giorgio Jackson (ex-president of the Catholic University Students’ Federation in 2011) is one of the most esteemed politicians in the country and Gabriel Boric (ex-president of the University of Chile Students’ Federation in 2012) is one of the most important figures for the political left outside of the government. But the political impact of the movement goes beyond congress. The cycle of mobilization of the student movement beginning in 2011 introduced in Chile a “social imaginary” – in Castoriadis’ conception - that is based upon framing the issue as one of a right, namely the right to education, and a demand to question the neoliberal logic dominant in Chile since the dictatorship. The challenge of the student movement to the political status quo feeds the highest expectations of social reform in the electorate that voted for Michelle Bachelet for President. Notwithstanding, the mandate to institutionalize this new “imaginary” carried the dispute to a field where the student movement has not had control. The prominence of the debate in the National Congress about the reformist laws coincides with the decline of the student cycle of mobilization and with the reluctance to take advantage of the opportunity to mobilize and to influence the debate. Additionally, the student leaders have rejected all of the proposed government’s initiatives because they don’t want to be associated with the government. Leaders’ critiques of the university reform become diluted in the more coherent opposition of neoliberal sectors, which hegemonize the resistance to the reform. In contrast, several researchers highlighted the keys to success of the Chilean student movements in 2011, on one hand its capacity to solve “the tension between internal unity and growing support”, via legitimate participation in their internal deliberations and via a creative association and cooperation with other social actors: the teachers’ trade-union, the labor movement, parental associations and the environmental movement. On the other hand, scholars stress its ability to simultaneously engage in protest and political negotiation. Nevertheless, the student movement left a process of radicalization after “the Chilean winter”, downplaying its power to go beyond its own organizations. The movement actually renewed its leaders, removing those who are considered to be close with Bachelet’s government. But the strategy of rejecting the path of negotiation was not accompanied with an increase in mobilization. The rise of the movement’s autonomy via its rapport with the political system should contribute to its isolation in this context of radicalization without mobilization. But in a year defined as educationally decisive due to the governmental announcements of proposed laws on this issue, building bridges with the political system concurrently with an intensification of mobilizations will be probable. Meanwhile, this change of strategies has consequences in the rapport of student movements with other social stakeholders. During the conflict between the government and the teachers' trade-union about the teachers’ career law (another byproduct of the “Chilean winter”) in 2015, important leaders of the student movement took an opposing position against the President of the teachers’ trade-union and in favor of the internal dissidents that were accusing him of being an agent of the government. A similar argument was utilized for not supporting the recent national strikes organized by the main Syndical Associations of Workers to demand changes to the proposed general labor law. Furthermore, the student movement lost political initiative, for example, when the conservative congressmembers objected to the budget allocation that began free university tuition by challenging it in the Constitutional Court (one of the institutional legacies of the dictatorship). Even when the verdict may be prejudicial for the students, who in theory benefited from free education, the leaders of the student movement don’t take a position because “it’s not our reform”. The students argue that their influence is not present in the proposed educational reform, therefore, they refuse to support it in the Constitutional Court. Does the addition of all these elements represent a political renouncement of the student movement? Not necessarily. Like some researchers claimed: “In the political dimension, the protagonists of the 2011 Chilean student movement would belong to a new generation of leaders who do not feel compromised by the limits imposed by the political transition from dictatorship to democracy, and feel capable of questioning the institutionalized arrangement inherited from that period, including market-oriented education”. The Chilean society is in a process of political self-construction, defining new parameters for its democracy and questioning the dictatorship’s institutional heritage. The result may not fulfill the exigencies of the student movement, but this moment is only possible because of the students’ pressure. In fact, this new political cycle is not finished, and will continue contending with the central agency of the student movement. The author thanks the political scientist Leesa Raps and the editors of openMovements for their insightful comments.